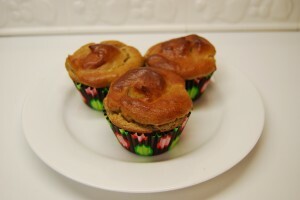 It’s hard to find a recipe for a low carb muffin that actually tastes good. For this reason, I created the Cinnamon-Chia Muffins. They have a delightful and mild nut and bean flavor with a light texture – as well as the added bonus of nutritional benefits. The 2 tablespoons of ground chia seeds give the muffins its voluminous quality – and makes them super healthy. Chia means “strength” in the Mayan language and the Aztec warriors received great energy and stamina by eating these seeds. Today’s distance runners use it for its endurance qualities. These muffins are made with soy flour, giving them a high protein content which helps build and maintain muscles. You also get a BIG muffin for 9.9 carbs with over 50% of the carbs coming from fiber. Fiber makes us feel full sooner and stays in our stomach longer. The best benefit of all is that fiber moves FAT through our digestive system faster which means we absorb less FAT. If you like variety, the Cinnamon-Chia Muffins are great to have on hand for breakfast or snacks – and even dessert. My favorite way to eat them is by gently pulling out serving bites – piece by piece, starting at the top. The muffins freeze and warm up perfectly! Use 2 muffin pans and coat 20 of the muffin inserts with cooking oil spray or line with cupcake liners and spray the liners. Use a large food processor or mix with an electric beater the following dry ingredients: soy flour, baking soda, baking powder, salt, ground chia seeds, cinnamon, and sugar replacement. Add the eggs, oil, sour cream and very hot water, adding as much water as necessary to allow it to form a thick and creamy consistency – if it’s sticky it still needs water. Let the batter rest for about 15 minutes as chia seeds have the unique property of absorbing liquid, so the batter thickens as it sits. Add more water to get the consistency you need to pour or scoop into the muffin pan or liners. Bake the muffins for 18-20 minutes or until they are lightly browned. Note: If you can’t find the ground chia seeds or do not have the proper kitchen appliance to ground your own seeds, you can order the Ground Chia Seeds from the Carb Light Living™ Store. After I make a batch, I immediately freeze them. I place a couple of muffins in a plastic sandwich bag and then place all of the smaller bags into a large zip lock bag for extra freezer protection. Pop them in the microwave for about 30 seconds or wrap in foil and let them warm up in the oven.